The revelations about the June 2016 meeting between Donald Trump Jr. and Russian lawyer Natalia Veselnitskaya raise a number of questions. Does taking the meeting constitute illegal collusion with a foreign entity? What exactly was discussed? What did then-candidate Trump know? There’s another question that’s fundamental to understanding how we even got here: why would Trump Jr. accept a meeting with a Kremlin-linked lawyer whose name he didn’t even know? The short-but-stunning answer, according to a Times report on Monday and backed up by emails that Trump Jr. himself tweeted out on Tuesday, is that Trump Jr. agreed to take the meeting after music publicist Rob Goldstone told him Veselnitskaya’s had dirt on Hillary Clinton, which was part of a Russian government effort to help his father’s campaign. The long answer starts three decades ago, and involves Trump’s hopes for a Trump Tower Moscow, a beauty pageant, and a Russian pop star. Trump and then-wife Ivana, who speaks Russian, traveled to Moscow to scout out potential sites and “met with a lot of the economic and financial advisers in the Politburo,” according to Trump’s spokesman. Nothing came of that project, but throughout the ’90s Trump proposed other building projects in Russia, filed at least eight trademarks in the country, and sold many condominiums in Manhattan’s Trump World Tower to “wealthy people getting their money out of what had been the Soviet Union,” as Bloomberg reported. Over the years, Trump’s business, personal, and political ties to Russia became so extensive that Politico needed seven charts to map them out. Donald Trump Jr. first appears in the timeline of Trump’s Russia ties in 2006, when he traveled to Moscow with his sister Ivanka to meet with potential business partners. They were shown around by Felix Sater, a Russian-American businessman with mob ties who worked with the Trump Organization for many years, though Trump has testified that he barely knew him. Sater was a partner in Bayrock Group, a Trump Tower tenant founded by former Soviet official Tevfik Arif. 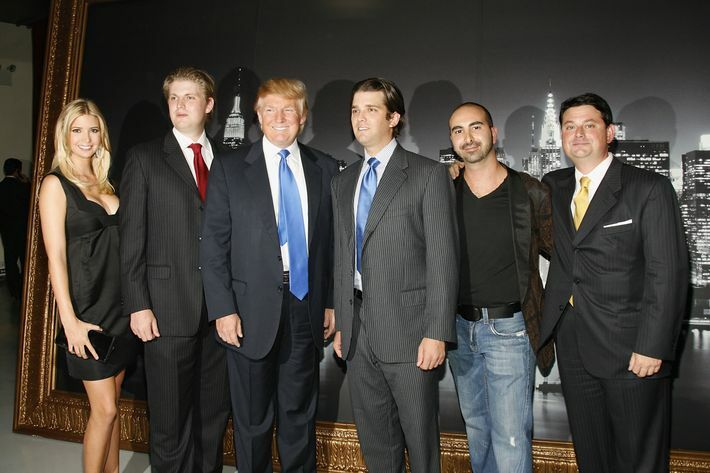 Bayrock was a key partner for Trump in the 2000s, working with him on several real estate development projects, including Trump SoHo, and scouting out deals in Russia and elsewhere. It is definitely not an issue of being able to find a deal – but an issue of ‘Will I ever see my money back out of that deal or can I actually trust the person I am doing the deal with?’ As much as we want to take our business over there, Russia is just a different world. Though the legal structure is in place for what we have today, and even 99 percent is covered, that 1 percent not covered could be 100 percent covered over there because it is a question of who knows who, whose brother is paying off who, etc. In June 2013, Trump announced that the next Miss Universe beauty pageant, which he owned, would be held in Moscow. 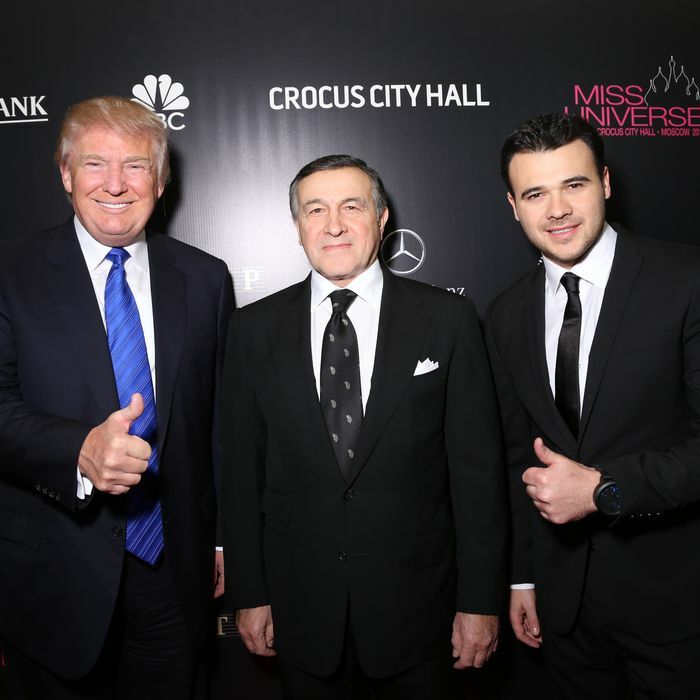 The move stemmed from Miss Universe 2012’s appearance in Russian pop star Emin Agalarov’s music video “Amor.” Miss Universe representatives then visited Moscow, and introduced Trump to Emin and his father Aras Agalarov, a billionaire Russian real estate developer. Aras has been called the “Donald Trump of Russia,” as he has a similarly ostentatious style and likes to put his name on buildings. In an interview with Forbes shortly after the November 9, 2013 pageant, the Agalarovs explained that they were eager to bring the pageant to Moscow to raise the profile of Crocus City Hall, a concert hall they had opened four years earlier. They said it cost them $20 million to host the pageant, and about a third of that was the licensing fees paid to Trump. Trump said he wanted to take the pageant to Russia because “Moscow right now in the world is a very, very important place,” and noted “one of the great families in Russia is our partner in this endeavor.” Trump was likely eager to develop relationships that could help him achieve his longtime goal of expanding his business in Russia. As Politico notes, Trump seemed particularly excited about potentially meeting Russian President Vladimir Putin. Putin didn’t show up to the pageant, and according to Aras Agalarov, he canceled a meeting with Trump at the last minute, though he sent him a note and a decorative box as a gift. (Trump has publicly contradicted himself on whether he ever met Putin prior to last week’s G20 summit.) He did manage to strike up a friendship with Aras Agalarov, who has won several contracts from the Kremlin and received Russia’s Order of Honor from Putin in 2013. @realDonaldTrump Mr. Trump thank you for brining #missuniverse to us we had an awesome time TRUMP tower Moscow - lets make it happen ! The Trumps continued their relationship with the Agalarovs long after the pageant. In March Emin told Forbes that he performed for Trump at one of his golf courses and was in his New York office shortly before he launched his campaign. After Trump won the presidential election, Emin congratulated him on Instagram and posted a video he sent him in 2014 for his 35th birthday. Emin said Trump sent him and his father handwritten notes thanking them for their congratulatory messages, and claimed he’d exchanged messages with Trump Jr. in January. The last piece in the puzzle is Rob Goldstone, who’s confirmed that he set up the meeting between Trump and attorney Natalia Veselnitskaya. He is a former British tabloid reporter who says he’s worked with Michael Jackson, Julio Iglesias, Cyndi Lauper, and James Taylor. He currently represents Emin Agalarov, and has freqently traveled between Russia and the U.S. According to the Guardian, his Instagram shows he made at least 19 visits to Russia since the spring of 2013, and he once described Moscow as his second home. His posts show he was in Moscow ten days before the Trump Tower meeting. Veselnitskaya’s clients include several Russian state-owned businesses and the son of a senior government official. She has been lobbying against the 2012 Magnitsky Act, which the U.S. passed to punish those suspected of being involved in the death of Russian tax lawyer Sergei Magnitsky, who uncovered a tax-fraud scheme that implicated several Putin allies. Russia retaliated by barring Americans from adopting Russian children. It’s a colorful cast of characters, but apparently they didn’t make much of an impression on Trump Jr. In March he told the Times that he never participated in any campaign-related meetings with Russian nationals.